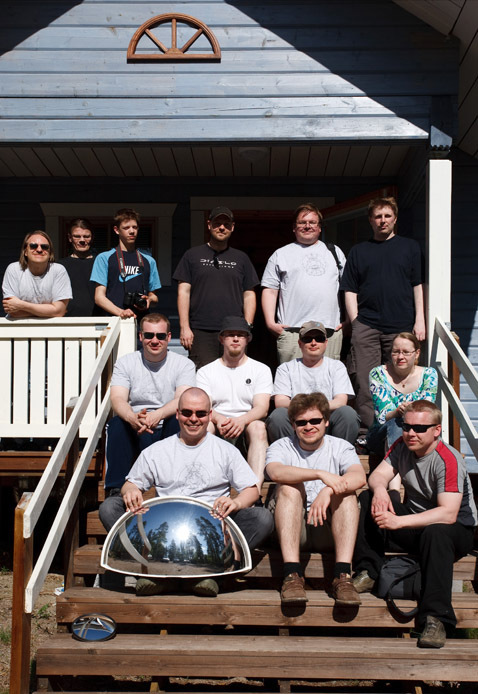 14-16 May saw Finnish atmospheric optics enthusiasts gathering in Finnish Astronomical Association's (URSA) Artjärvi observation center. The programme for the meeting included presentations on noctilucent cloud observations, halo simulations, chdk-software for compact cameras, diamond dust halo chasing as well as a presentation on a home made ice crystal gun. Developing the observation network's wiki tool was also discussed. The programme (in Finnish language) is available on the Internet (1). Huge thanks go to every participant - you made the meeting a success! The next meeting will take place either next summer or a year after that. 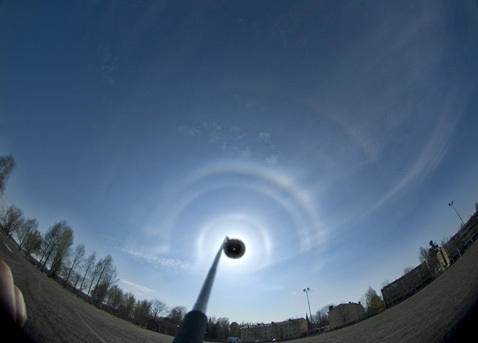 Alexandr Shinder made the above panorama of the odd radius display he observed in Kiev, Ukraine on 31 March 2010. Further images can be viewed on his blog ( 1 ). Summer's first hot weather spell started on 12 May in Finland, and along came solitary 23° plate arc. Yesterday it got warmer (+24°C) and also the halos got warmer. Odd radius column arcs! In addition to 9° and 24 column arcs (the latter of which always shows as a circular halo) I recognized the 18° column arc in the field, which gave me some satisfaction. 35° halo was visible only through mirror. The 24° column arc was clearly separated visually, but fisheye compresses it close to 22° halo. Should photograph these with normal lens. Click on the above image to see 18° and 20 column arcs marked. There are other images also available; those where sun is behind the lamp are max two minutes stacks, and the sun is not tracked ( 1 ). 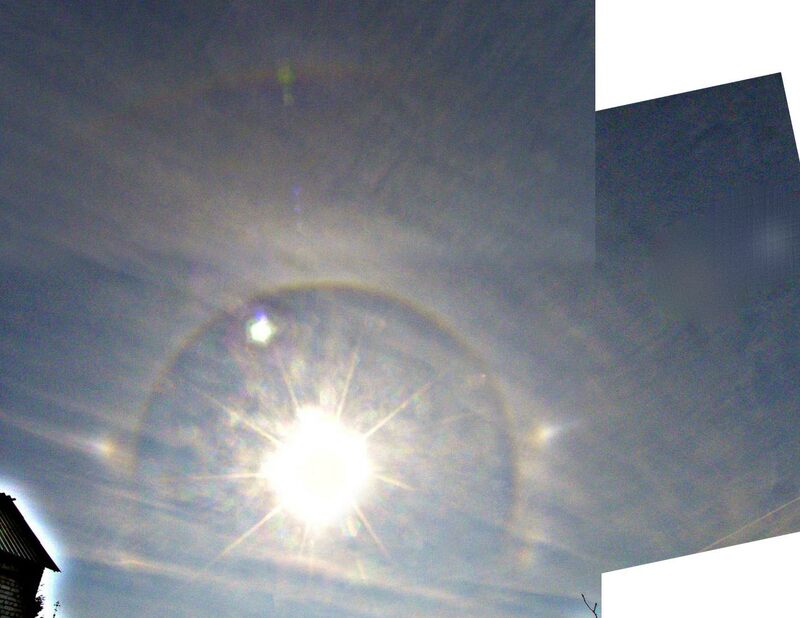 There is also, before the odd radius started, photo of parhelia with sun elevation of 33 degrees ( 2 ). Do you think there is something strange? To me they seemed not be on a same level. Although in the photo it may look like the right one is abnormallly high, it was actually the left one that was abnormally low. Or at least that's how it looked. I knew this is hard to photograph because of the lens distortion. Maybe it was illusion. I have seen these things also before, at least in 30.9.1987 display. Also that time it got me rushing to photograph it. But that photo is not conclusive either. Here are some simulations to follow up with the possible new arc from Moilanen crystals ( 1 ). 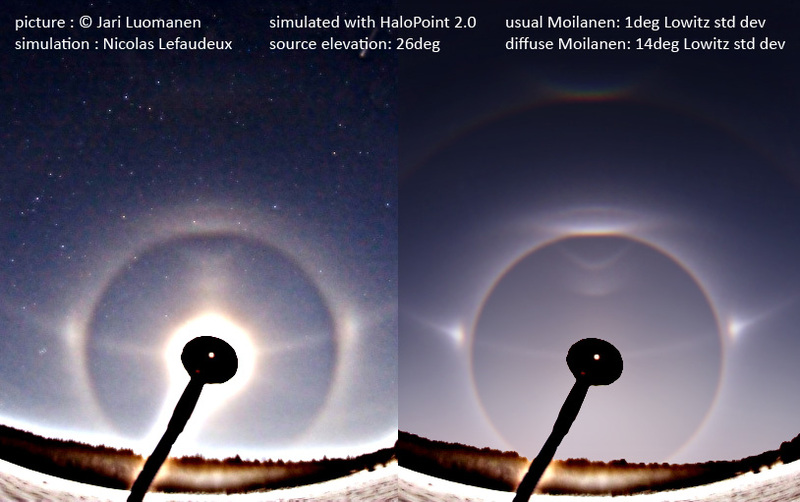 As suggested by Marko, I did some “photo quality” simulations with the two Moilanen arcs using Jukka Ruoskanen software. The Moilanen crystals are simulated using 34deg prisms pointing up. First I simulated Jari Luomanen’s picture ( 2 ) which shows best the two arcs. I found that two Moilanen population tumbling with 1° and 14° deviation matched well the display. Then I tried to compare two low source elevation displays from Marko Riikonen ( 3 - 4 ),and Milan Osecky ( 5 - 6 ). I simulated them with the same populations as the one I found from Jari Luomanen picture (1deg and 14deg standard deviation tumbling angle). The differences between the two populations are pretty subtle at this low source elevation. They are mostly in the shape of the outer edge of the Moilanen arc and in aspect which can be either hollow or solid. New arc has a more solid and curved edge. Although it is difficult to know for sure, I think the two pictures show the two different arcs. Finally, I did some simulations that shows how one arc becomes another when the tumbling angles are increased, and for different source elevations ( 7 - 8 - 9 - 10 ). The limit between the two arcs would be somewhere between 8 and 16deg tumbling angles. The amount of crystals is kept constant in the simulations so brigthness can be compared. The two arcs vanish quickly when source elevation is increased. With the tumbling angles used (up to 64deg standard deviation), no lower component appears for the new arc. The phenomena began about 30 minutes before sunrise (which was at 5:58am local time) and faded completely about 30 minutes after sunrise. 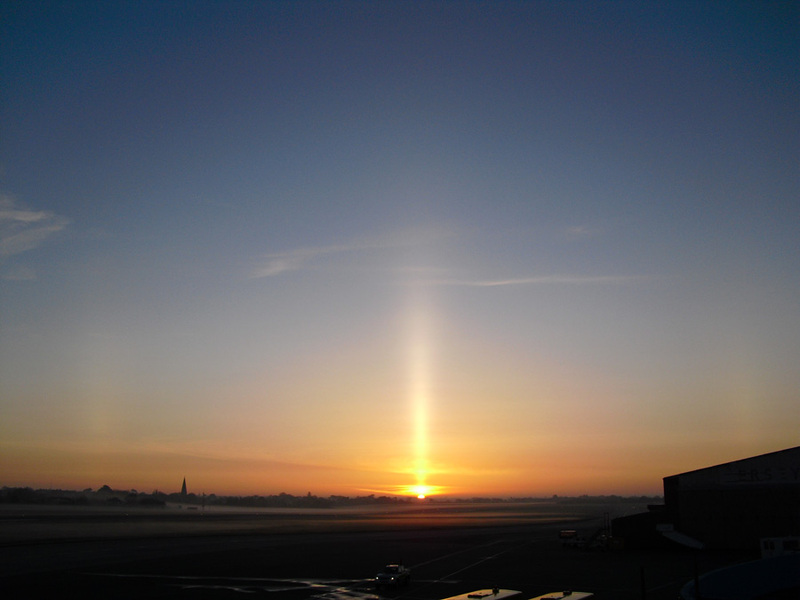 Apart from the main sun pillar you can see faint pillars to the left of the church and also over the hanger building on the right hand side.